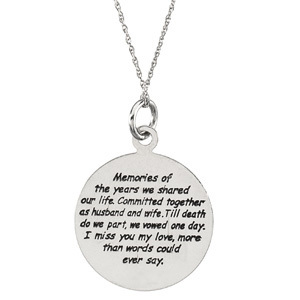 Loss of spouse pendant and chain is made of 14k white gold. Designed by Susan Howard. 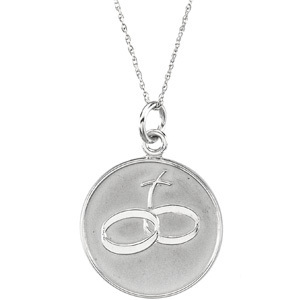 The pendant features two interlocking rings and a cross. Pendant size: 20mm, slightly larger than a penny. Through faith and compassion Susan Howard has poured out her heart and created Comfort Wear Jewelry. Among the collection you will find a wide selection of memorial jewelry designed to help bring comfort to grieving loved ones. Etched on the back you will find beautiful prayers specific to each piece inspired by faith.